I recently gave a presentation at the Miami IA Summit about Information Architecture and user-centred design ideas for widgets, and I very often blog about newspaper websites on currybetdotnet, so it seemed like an obvious idea to put the two together, and blog about newspaper widgets. In the previous two posts I've looked at the Yahoo! Widgets and Google Gadget platforms. Today I want to turn my attention to the Internet darling of 2007, Facebook. The decision to open the network up beyond people with a certified college email address certainly boosted the user numbers of Facebook, but arguably it was opening up their application platform that caused the site to sky-rocket in popularity over the last year. The majority of Facebook applications are more sophisticated than the average widget, often consisting of several different 'pages' as well as a small unit that can be added to your personal profile. However, it should be noted that not everybody thinks that Facebook has the potential to develop into a platform for serious utility applications - "Facebook Apps Are Still for Toddlers: The Visual Proof!" When I was checking the site, I only found three papers with an official application presence on Facebook, with The Sun and The Telegraph leading the way. 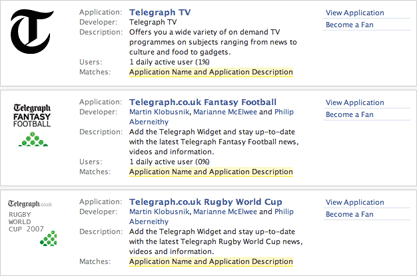 The Telegraph has 3 applications on Facebook. Two of them mirror the content also made available on the Google Gadgets platform - Fantasy Football and the 2007 Rugby World Cup. The additional Facebook application is for The Telegraph's venture into video content Telegraph.tv. The Financial Times has an application on Facebook which offers a subscription discount to students. However, it looks like the FT are risking more damage to their brand than doing good with this offer. There are several complaints posted by disgruntled users of the app, seemingly with no official response so far. If the advantage of having a successful viral application on Facebook is that it promotes a healthy recommendation culture around your brand, then you need to make sure that you are actively managing that reputation. "It is really, really, really cheeky to get you to 'share' this application with your friends and then later reject you saying 'this is only for students'. It adds insult to injury when you ARE, in fact, a student! FIX it FT! You have enough cash and technical know-how not to behave like a bunch of amateurs or amoral spammers! " The Sun has several applications on Facebook, concentrating on the entertainment arena. There is are TV gossip, celebrity gossip and Big Brother news applications from the paper. There is also an application in support of The Sun's Premier League Dream Team competition. Like the Google Gadgets, the applications are developed by Laurence Aronberg with an additional credit to interactive producer Ilana Fox. The Sun also have applications under the MY Sun brand on Facebook, in fact, I've written before about their 'Girl next door' application. It isn't easy to find on Facebook, since it doesn't turn up under searches for 'Sun' or 'MY Sun'. The easiest way to install it to visit The Sun's own pun-laden promotional article about the service. I say that only three newspapers have an official application on Facebook, but I did also spot that The Guardian's Jemima Kiss has her own Facebook application. Rather depressingly, this suggest that not only have British newspapers not really got to grips with entering the widgetsphere with official products, those that have are yet to work out the way to build a decent audience and get an ROI on them. By Martin Belam on 14 May 2008. Yeah, a Kiss stalker I am! Honestly, Jemima is a friend and I made that FB app for her last year - the items come from her del.icio.us feed. Are you positive that The Guardian doesn't have any FB apps? Kevin Anderson would know . . . The numbers on the application are much higher than the number of "active users" - that number is the quantity of people who are discussing, reviewing, and debating the validity of the word 'burning' in the app on a daily basis. The total number of people with the application was over 5,000 at one point, but has since dwindled to about 3500. Unfortunately that's all moot now as the application doesn't work on New Facebook and I'm not sure if I want to go through the trouble of making it work.